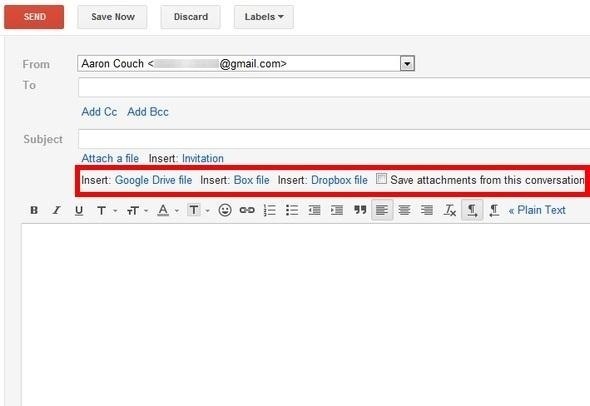 Attaching files to an email is way more convenient than trying to link people to third-party file transfers. Unfortunately, the standard 25MB limit is far too small to send some files, like large videos or multiple audio files. But you can circumvent that issue with a service called Attachments.me, and send up to 100MB in one email. Best of all, it integrates with your Dropbox, Box, or Gmail account, making it possible to attach and email huge files without even leaving your email window. To see it in action, watch this video on Vimeo, or just check out a general demo of the complete Attachments.me service below. Head on over to their website to learn more.